Lorna's Laces is a hand dye company based in Chicago. Available in tonals as well as multis, this 80% Superwash Merino Wool 20% Nylon blend is soft, yet strong enough for great socks. The multi colors pool and swirl in unique ways, creating one of a kind socks for each knitter. They knit up especially interesting in slip stitch patterns. 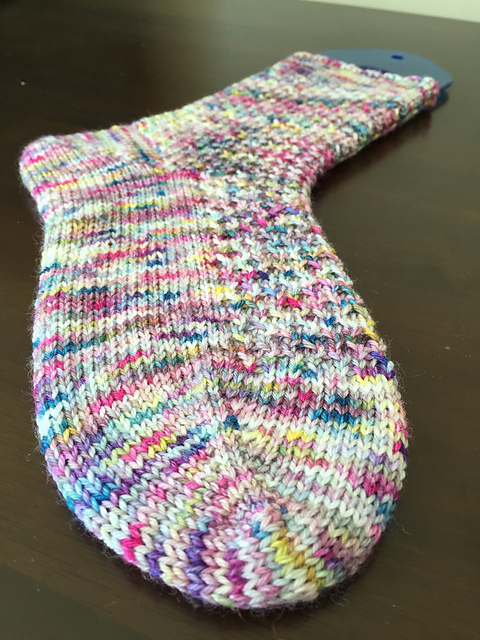 The tonals do well in all sorts of socks, from lace to cables, with a subtle color shading they add interest and depth to create stunning socks. Our favorite slipped stitch sock is Amy Stringer's Scatterby Socks. This free pattern uses a unique slip stitch pattern to intentionally break up pooling that can happen with handdyed yarns. Plus, the pattern creates a little bit of interest while you're knitting. Link available here: Scatterby Socks. Image © Amy Stringer. Knitting Gauge: 6.75 - 8 sts = 1"
Crochet Gauge: 21-32 sc = 4"